My sister gives marvellously good presents. From Barbican and BFI membership (for reals, she’s great) to random infusions of goodies, she is a thoughtful soul. On her last visit to London, she bore with her this curious drink – a loose leaf tea liquid concentrate in a bottle. The 6teas premise is simple. They brew, blend and bottle loose leaf teas in, well, six varieties from vanilla roiboos to green. The flavour K chose for me (knowing me well) was an Assam and Darjeeling blend known as the ‘Big Daddy House Blend’. Each bottle has six servings, and serving sizes are marked in a scale down the side. The tea looks pretty cloudy at this stage – like that horrible tea with a drop of milk some people insist on slurping (make a commitment – milk or no milk). Now, I do love me some loose leaf tea, and I’ve become a really ridiculous tea snob, it’s true. 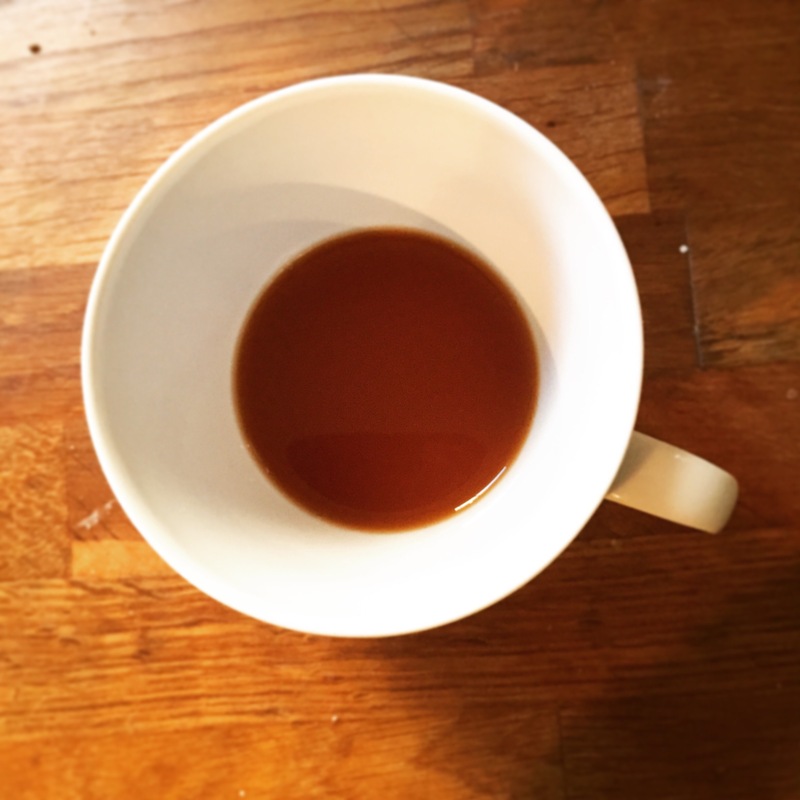 Once you’ve got in the habit of properly brewing and drinking it, you realise that most teabags do actually taste of stewed powder and paper, and if you drink black tea – both type and milk status, as I often do – it’s simply not appealing from a bag. I’ve taken to only drinking roiboos in the office as the teabags are less grim (yes, yes, privileged problems, I think we’ve established that). Still, I thought it was possible that liquid tea concentrate might be taking my tea hipster credentials just a tad far and – I admit – I thought it might taste a bit peculiar. So, in with the serving into a mug, giving it a quick sniff (really rather nice). I went with a whole serving to begin with, although many of my mugs and teacups are quite small and K had said she goes for a weaker tea and can usually get seven or eight servings from a bottle. In it went. In went freshly boiled water. The cloudiness vanished, and there was a dark amber cup of tea with a strong, natural scent. You know what? It’s lovely. Delicious and fresh. In fact, it tastes like a genuinely lovely cup of home-brewed proper tea. And unlike making Darjeeling at home it can’t be overbrewed (it’s such a bloody hard one not to tip into bitterness and since sugar in tea is an abomination unto Nuggan I am not going there). I’ve taken the rest of the bottle to work where I am, indeed, having slightly smaller servings for a lighter cup, and enjoying the taste of proper tea while it lasts. It does need to be refrigerated once opened, but as I sit in an open-plan office around 15 feet from a fridge, this isn’t a problem. And yet… here comes the sticky bit. The cost. 6teas sells the tea in 3-packs, so 18 servings for £15.00. Even if you’re going to extract more like 22 servings, you’re still looking at, essentially, at least a 70p cup of tea. Now, knowing the costs of loose leaf and taking into account packaging, marketing, staff and expertise, I don’t think they’re overcharging in the slightest. From that perspective, I think it’s actually phenomenal value. But from my budget perspective, my 100g boxes of leaves can extract around 30 cups for around £10 (or 33p per cup). This is still way more expensive than a teabag, obvs, but we’re all a bit stupid about what we do with any disposable income we’re lucky enought to have, and that’s my indulgence. So what I need is tea fanatics with more money than me to spend lots and lots at 6teas until it brings the cost down a bit for all the rest of us. All that said, I think it’s something I could be persuaded to get now and again, and if I attend the market in Yorkshire where my sister picked up her bottles I would buy some in person to support a local business I think has come up with a great-tasting, interesting, different product. Personally I’m not a fan of fruit infusions or floral blends – jasmine yes, Earl Grey yech – plus I don’t like vanilla flavouring in tea so I’d stick to BD or the green variety, but I hope they’ll be able to branch out to look at an oolong blend with a bit of success and encouragement. Or you can mix and match three together, or buy a gift card for a tea-obsessed friend. All available to buy online. Disclosure: None needed as this was a gift and a voluntary review. I also blog with a friend about tea at Oolongingly. ← Previous Post Once there was a… failure?